Did you know every time you sit at your office chair, you’re jeopardizing your health? When it comes to sitting, you’re putting yourself at risks of sitting health hazards. Yes, sitting for extended periods of time on the daily can be very detrimental to your health. On average people in the United States spend at least 8 hours every day sitting and that in itself can cause major health problems. What kind of health hazards come from uncomfortable sitting? Plenty. We are here to share with you the most common health problems office workers face from inadequate sitting. Organ damage. Yes, you can harm your organs when you sit in the office everyday. Remember, your muscles are designed to burn fat and circulate blood throughout your body. If you sit for extended periods of time, you could increase your likelihood of having heart disease. The heart is a muscle. Heart disease comes as a result of sitting for too long, too frequent. Sitting can sky rocket your blood pressure and elevate your cholesterol. You can even suffer from diabetes because your muscles are more idle than active. Foggy Brain syndrome. Anytime we are positioned in a seat for a long time, our brain functions can slow down because we are not active enough for our muscles to pump adequate amounts of blood and oxygen to or brain. In fact, our sluggish can make us more inclined to strain our necks as we work at our our office desks. Colon Cancer. By remaining still for long periods of time, we put ourselves at a higher risk of cancer because our body cannot release the natural antioxidants we need to kill free radical cells. Inflexible spine problems. By sitting unevenly at our office desks, we make it difficult on our spines to soak in fresh blood and nutrients. Instead, our collagens harden, which makes it more difficult for our bodies to support our tendons and ligaments. We may even experience disk damage from sitting for too long. From poor blood circulation in the legs to soft bones, you need to keep in mind how long you spend sitting in your office desk. How do you feel in your current office desk? If you feel uncomfortable or in pain, it’s time to purchase a new ergonomic office chair. You need to also remember from time to time to get out of your chair and workout. It only takes 10 minutes of fitness at work to keep you healthy. You can walk around. You can take a run. You can do some stretches. Do something to keep your varicose veins from experiencing blood clots and protect yourself from osteoporosis. Purchasing a new ergonomic chair for yourself will help you keep your back straight, shoulders relaxed and your elbows properly angled at 90 degrees. It’s crucial to your healthy well being that your ergonomic chair provides you plenty of lower back support and keeps your feet flat on the ground. By purchasing a high quality ergonomic chair and ergonomic furniture from Mark Downs Office Furniture, you keep yourself healthy and reduce the number of days you have to miss from work related to orthopedic problems such as severe back pains. Mark Downs Office Furniture is the largest display of office furniture in Maryland. We can help furnish home offices, office suites, and whole commercial buildings. We are known for offering the best values in new, used, and gently abused furniture: desks, chairs, files, tables, office panel cubicles and panel systems. 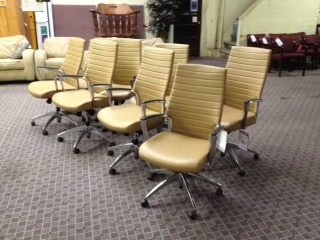 Ergonomic chairs/ ergonomic furniture are our specialties! Come on in to our showroom. We’re worth the drive! If you see something you like on our office furniture website, come to our Mark Downs Office Furniture store on 10912 York Rd Suite 300C, Cockeysville, MD 21030 today to find great home office furniture. Categories: Furniture Purchasing Tips | Tags: Ergonomic furniture, Ergonomic office chair, Mark Downs Office Furniture, Muscle, and Why is is important to have a high quality office chair? This entry was posted on Wednesday, January 22nd, 2014 at 1:09 am. Both comments and pings are currently closed.